Year1600It all began with a battle. In the year 1600 Japan was a very different shape than it is today. The country was divided into many small states, each ruled by its own lord, but as tensions grew, these states split their allegiances into a Western and an Eastern Army. The critical battle to win control of the countrycame at last when these opposing samurai armies met on the fields of Sekigahara, in present-day Gifu Prefecture. The Eastern Army of warlord Tokugawa Ieyasu emerged triumphant, and for the first time in many years, all of Japan was united under his rule, which would become Japan’s first shogunate. Naomasa Ii was a favored lord of Ieyasu’s, and for his contribution as first into the fray at the Battle of Sekigahara, Ieyasu gave Naomasa Ii the Castle of Sawayama, making him lord of what is now Hikone. he died in his castle of complications from a bullet wound he received at Sekigahara. A new location was determined for the castle on Mount Hikone. After Naomasa’s death, the castle fell to his son, Naokatsu, at which time Tokugawa Ieyasu determined it should be moved to a nearby hill known as Hikone-yama. Thus began the arduous process of de-constructing Sawayama Castle, and dragging stones to the site of what would become the brand new Hikone Castle. Given Hikone’s central location in regards to other castles and territories of the time, this new castle was considered to be strategically important, and its construction was rushed. In order to hurry the process along, materials were brought from various nearby temples and defeated castles. 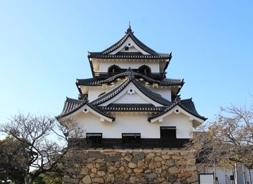 Reportedly, Hikone Castle’s main tower was salvaged from the former Otsu Castle. In the winter of 1614 and the summer of 1615, Tokugawa Ieyasu waged two campaigns in Osaka. Current lord Naokatsu’s brother Naotaka went to fight in his stead, and won reknown for his bravery in the Battle of Tennoji. In the spring of 1615, Naotaka was awarded his brother’s lands, and named the new Lord of Hikone. Though the main keep had been completed sixteen years earlier, in 1622, Hikone Castle at last stood proud and completed, enclosed by its outer moat. A fire broke out in one of the castle’s main turrets, greatly damaging several of the structures. Koto-yaki pottery began to appear around this time, and after 1842 Hikone Clan itself became directly involved in its production. 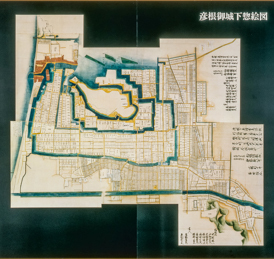 Hikone Domain was dissolved after the restoration of imperial rule in 1867, bringing Japan into the modern period, and eliminating Hikone’s feudal class system. Under orders from the new Meiji government, the Ii family relocated to Tokyo with many other former daimyo and their families. There, the Emperor, newly restored to power, could keep watch over them. With the end of the shogunate and the restoration of power to the Emperor in the late 19th century, the destruction of many of Japan’s feudal castles was ordered. These castles had historically belonged to the daimyo, or warlords, who were loyal to the shogun. To signal an end to its feudal past, Hikone Castle, too, was slated for destruction. However, just a month later, the Emperor visited Hikone on his way to a tour of northwestern Japan, and was there convinced by a trusted advisor to suspend the castle’s demolition. The main buildings were preserved, and today Hikone Castle is one of the best surviving castles anywhere in Japan. 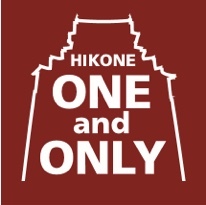 Year1894Hikone Castle was bequeathed to Hikone Domain’s last castle lord, Ii Naonori. Ownership of Hikone Castle and its grounds was passed from the Ii family to the City of Hikone. The 400th anniversary of the construction of Hikone castle.